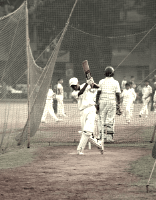 The origins of this sport are not certain, however the first recorded mention of cricket dates from the 1500’s. Cricket was probably originally a game for children, however adults had begun participating by 1611 with the first village cricket match being held around that date. During the 1700’s, the game went through several developments, with rich patrons creating their own teams. Large matches were held from the middle of the 18th century in Finsbury with crowds attending to cheer on the teams. In 1760, bowling was changed from rolling into pitching and a straight bat was introduced instead of the existing hockey stick shaped one. In the 1760’s, the Hambledon Club was founded and it remained the focal point of the sport until the MCC was formed in the 1780’s. Other changes during the later half of the 18th century included the introduction of the LBW rule and the arrival of the three stump wicket. In ancient times, the Romans and Greeks played a number of ball games, some involving using the feet, and some of these are thought to be similar in style to rugby. However rugby as we know it today was not invented until 1830 when the pupils of Rugby School commonly ran with the ball during play. This style of playing gradually spread across the UK during the middle years of the century and the first official rugby match took place in Scotland in 1857. The first club known to be playing rugby outside the British Isles was the Montevideo Cricket Club which was founded in Uruguay in 1861. This shows the spread of the game across the world. The UK’s first rugby clubs were formed during the 1870’s and 80’s and the Rugby Football Union was founded in 1871 with the first recognised international rugby match being played in the same year between Scotland and England.